£100 TO BE PAID AS DEPOIST (NON REFUNDABLE) TO SECURE YOUR DATES . PLUS £100 SECURITY BOND THAT WILL BE RETURNED ONCE CARAVAN HAS BEEN CHECKED FOR BREAKAGES/DAMAGE. FULL PAYMENT TO BE PAID 6 WEEKS BEFORE YOUR HOLIDAY COMMENCES OTHER WISE YOU WILL LOOSE DEPOSIT & £100 SECURITY BOND. We have the perfect 3 bedroom caravan for your stay at Little sea, close to Park Amenities yet away from the all the hustle & Bustle if you prefer the quiet. Fully fitted kitchen plenty of cupboards for your storage with Fridge freezer, Microwave, kettle, toaster & crockery for 8 people. Lounge/dining room has plenty of seating and table and chairs for you to enjoy meal times. 32 inch Television /DVD player. 3 bedrooms 1 double & 2 twin bedrooms with pull out settee in the lounge will comfortably sleep up to 8 people. Caravan has a bathroom with shower sink & WC and a additional W/C & sink. Outside you can enjoy sunny days on the Patio and park your car directly out side the caravan. Entertainment passes are not included, but these can be purchased on arrival. Additional Info: The park is the perfect place if you’re looking for lots of things to keep the whole family entertained – plus it’s a great location in a beautiful part of the UK. Set on the stunning South Coast, this park features an indoor swimming pool with all kinds of water spouts and sprays, outdoor pool, Nature Rockz activities, adventure golf and family entertainment – more than enough to keep you and your family busy. At the end of the day make sure to grab some mouth-watering food at the Mash and Barrel bar and restaurant, or a much-needed caffeine fix at the Starbucks coffee house we have right here on park. A lovely holiday home, immaculate condition throughout, good location and nice area to sit/have barbecues outside. Very nice site, great entertainment and value for money all round. Stayed for a week at this beautiful park. The facilities are excellent and plenty to do for all ages. The caravan itself was pristine and is only a short walk to the entertainment complex. This park is very well run and the owners and the haven staff were always helpful and courteous at all times. 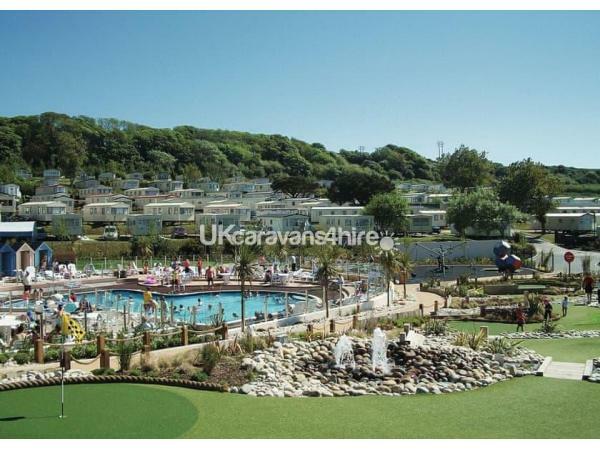 If you're looking for a lovely getaway in a beautiful seaside town such as Weymouth, then this is the park you need to book, and this caravan ticks all of the boxes for cleanliness, comfort and luxury.